The Javeler TO-75 is currently the third largest hydraulic dredge pump in our fleet. This compact system moves large volumes of material while maintaining the advantage of controlled discharge. Javeler is committed to providing exceptional customer service. Our experienced and knowledgeable team gladly accepts the opportunity to assist you 24 hours a day. Our centrally located New Iberia, LA operations headquarters enables quick response to the entire Gulf Coast. Our team of qualified field technicians provides expertise in equipment layout, dredging support, equipment maintenance/repair, and daily reporting to ensure optimal productivity and, most importantly, a safe operating environment. Every field technician is TWIC, SafeGulf, HUET, CPR and Rigging certified. 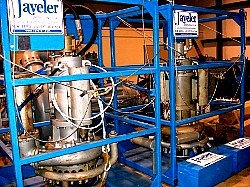 Javeler offers more than just excavation equipment. After 40 years, Javeler remains an innovative leader in applied and responsive dredging solutions. Pioneering deep-hole excavation in the Gulf of Mexico, Javeler remains committed to expanding and perfecting our tooling capabilities, techniques, and global presence. © Copyright 2019, Javeler. All rights reserved.